Most people don’t know just how important the town of Kenosha, Wisconsin was to the automobile industry, and how important the automobile industry was to the town of Kenosha. For about 100 years, car manufacturing had a huge presence in the city, and a big part of that was the AMC plant. Here’s some newly-posted-to-the-internet footage—possibly not seen in the last 30 years—of the legendary facility. Sitting on the western shore of Lake Michigan in the southeast corner of Wisconsin, Kenosha was once an automobile manufacturing powerhouse, with history reaching all the way back to the turn of the 20th century when bicycle maker Thomas Jeffery started selling his “Rambler” a year before Henry Ford got in on the fun with his Model A. After clashing with founder William C. Durant, former General Motors president Charles Nash eventually bought the successful Thomas B. Jeffery Company, changing the name to Nash Motors, which later joined up with household appliance company Kelvinator, which in 1954 merged with Hudson to form American Motors Corporation. AMC bought Jeep from Kaiser in 1969, but still had to get bailed out by Renault—who was hoping to use AMC’s dealer network—in the late 1970s. Chrysler’s CEO Lee Iacocca bought AMC in 1987, and later decided to close the Kenosha facility. 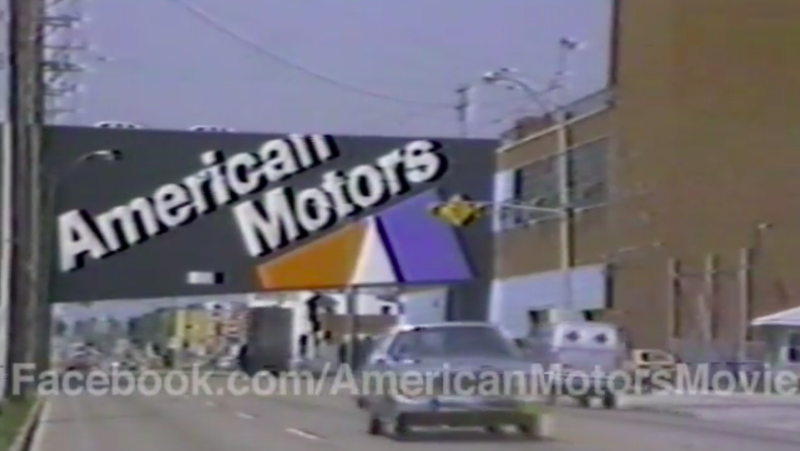 Chrysler sales had been slowing in the late ’80s, so something had to give, especially after the company picked up three new plants with the purchase of AMC—plants that just added excess capacity. Closing the auto manufacturing facility—which at that point was building the Dodge Omni, Plymouth Horizon, Chrysler Fifth Avenue, Dodge Diplomat and Plymouth Fury, and which previously built AMC Eagles, Concords, Spirits, Gremlins, AMXs, Rambler Americans and tons more—on Dec. 22, 1988, and ending car production in Kenosha as we know it, was hugely controversial. (AP Photo/Richard Drew). Caption via AP: The chairman issued a gloomy forecast for the industry. He said the company was planning for a leaner 1988 and 1989 and defended the decision to close the former A. M. C. plant at Kenosha, Wis., because it was no longer competitive. ﻿The logical move was to close the aging Detroit factory where the K-cars were built. But the facility was Chrysler’s only assembly plant in the city fo Detroit, and Mayor Coleman Young had worked hard in 1979 to help the Chrysler bailout effort. Union politics were important, too. The Detroit factory stood on Jefferson Avenue ,just four miles due east of Solidarity House, the UAW’s headquarters. It was one of the city’s worst neighborhoods, where jobs were virtually nonexistent. Closing Jefferson Avenue, as the plant was called after the street that it straddled, would have touched off a powderkeg. From there, things got pretty ugly, with AMC upset that Chrysler wasn’t the “corporate savior” it had made itself out to be. Comeback talks about Rudy Kuzel, the chairman of UAW Local 72 in Kenosha, and how he dispatched workers around the country to picket Iacocca with “Iacocca Lied” signs. Kuzel told the Wall Street Journal in 1988: “Lee Iacocca represents what’s wrong with corporate America. He doesn’t care any more about American than Joe Stalin did.” The book says Iacocca eventually gave in to a $250 million “peace offering” to help train laid-off workers for other jobs. There are definitely conspiracy theories around the closing of the Kenosha plants. According to Chrysler’s own internal data, Kenosha cars had the fewest defects on average, but Kenosha workers also had some of the the highest average compensation. Renault had spent a boatload of money upgrading the plants with robots, but much of the facilities were outdated. Certain models required trucking unfinished car bodies across town for final assembly. Prior to the Chrysler buyout, AMC was negotiating a deal with the union for the assembly of the ZJ Grand Cherokee, but since union relations were so bad at that point, things were dragging on. As soon as the Chrysler buyout was announced, negotiations stopped. The factory at Kenosha had its own in-house TV station, and they’d produce content to show on the TVs in the plant break rooms. One guy kept all the tapes, and when he died his wife donated them to a Kenosha museum. The museum can’t afford to digitize all the stuff, so our documentary team volunteered to help them out. This plant closure left Kenosha with only their engine production facility called Kenosha Engine, which built legendary engines like the 4.0-liter straight six and the AMC 360. Production ceased in 2010 after Chrysler’s dark DaimlerChrysler bankruptcy, with the final engines being 2.7-liter V6s and 3.5-liter V6s found in Chrysler passenger cars. Demolition began in 2012, and with that, the Kenosha automotive era came to an end.